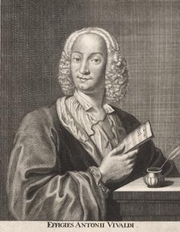 Antonio Vivaldi, nicknamed "il Prete Rosso" (the Redheaded Priest), was an ordained priest and a composer, as well as a famous virtuoso violinist. His best-known work is The Four Seasons, a series of 4 violin concerti. According to his own account, Vivaldi had become a priest in 1703 against his will and after a year he was no longer active in this role. He spent most of his life working at the Ospedale della Pietà in his native Venice – which, though often termed an orphanage, was actually a home for the girl children of noblemen and their mistresses. Many of Vivaldi's concerti were created as exercises to play for and with his many talented pupils. Antonio Vivaldi is currently considered a "single author." If one or more works are by a distinct, homonymous authors, go ahead and split the author. Antonio Vivaldi is composed of 9 names. You can examine and separate out names.